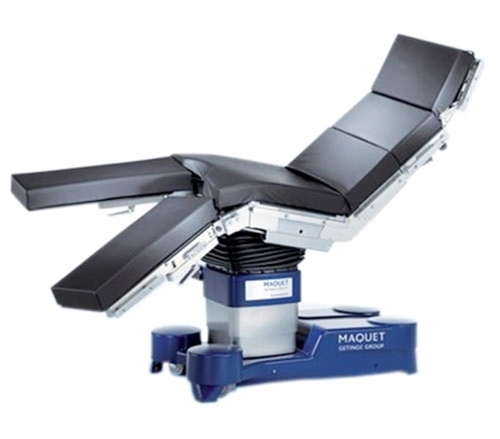 With a few positioning adjustments and optional accessories, the Maquet Alphamaxx 1133 is ideal for operations in gynecology, urology, orthopedics, traumatology and even neurosurgery. The table features electro-hydraulic actuators that control longitudinal shift, lateral tilt, and various table angles. The Alphamaxx 1133 adjusts from 23.4 to 41.6 inches in height, allowing clinicians to work comfortably from a sitting or standing position. An easy click mounting system allows for a wide range of accessories to be quickly added to the table, efficiently transforming the chair for each unique procedure. The durable table’s maximum load capacity is rated at 990 pounds. 6-section table features head plate, upper back plate, lower back plate, seat plate and leg plates Unique split leg design for a wide range of positioning capabilities. Electro-hydraulically driven actuators control table movements. The motorized longitudinal shift for C-arm access. Individual leg plate adjustment, back, and headrest manipulation. Height adjustment allows for patient and clinician ergonomic comfort. Easy click mounting for a wide range of table accessories. The powerful table has a load capacity of 990 pounds. Support arms, leg clamps, joint cover, column casing and side rails made of durable, chrome-nickel steel. Corded hand remote, wireless controls, and footswitch available for the Maquet 1133. Emergency override panel on table column. Rechargeable battery and mains operation. 4 swivel casters for easy maneuvering. Mattress features 3.1-inch, SFC padding.